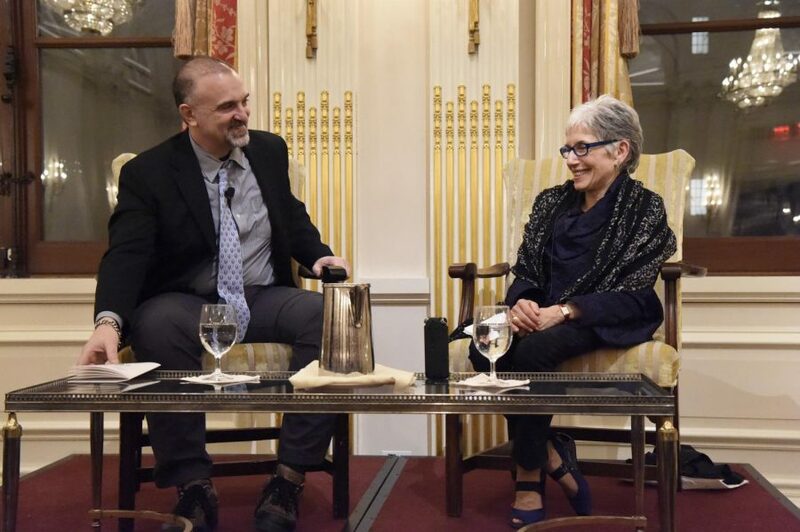 The highlight of the evening was a talk between Dr. George Yancopoulos '76, Co-Founder, President, and Chief Scientific Officer at Regeneron Pharmaceuticals and Ms. Dava Sobel '64, award winning science author. 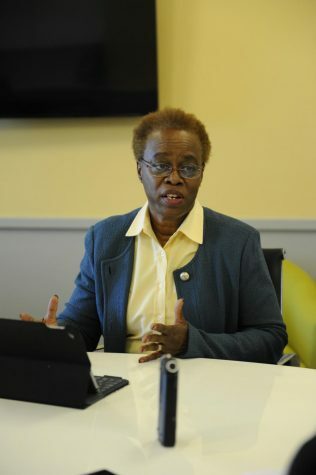 The Bronx High School of Science Research Program has been a long-running opportunity for students to conduct original research. It currently features a three year course of study to develop a project, write a scientific paper, and submit to the Regeneron Science Talent Search Competition. 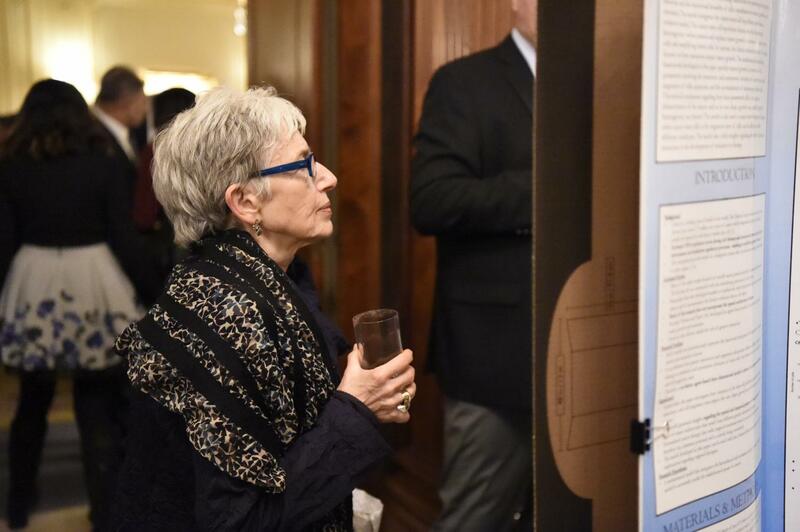 To honor our Bronx Science seniors who completed the program this year, Jonathan Freedman ’74 and his wife Aimee Freedman (parents of William Freedman ’21) hosted a celebration on Wednesday, January 30th, 2019 at The University Club in midtown Manhattan. 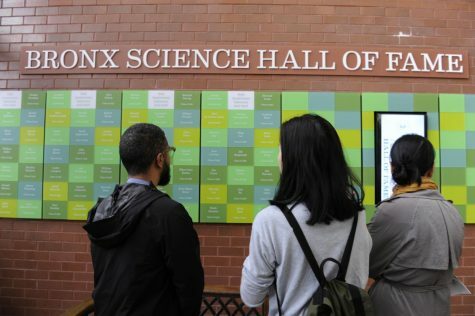 Family members, faculty, mentors, and Bronx Science alumni were invited to learn about the students’ research work. 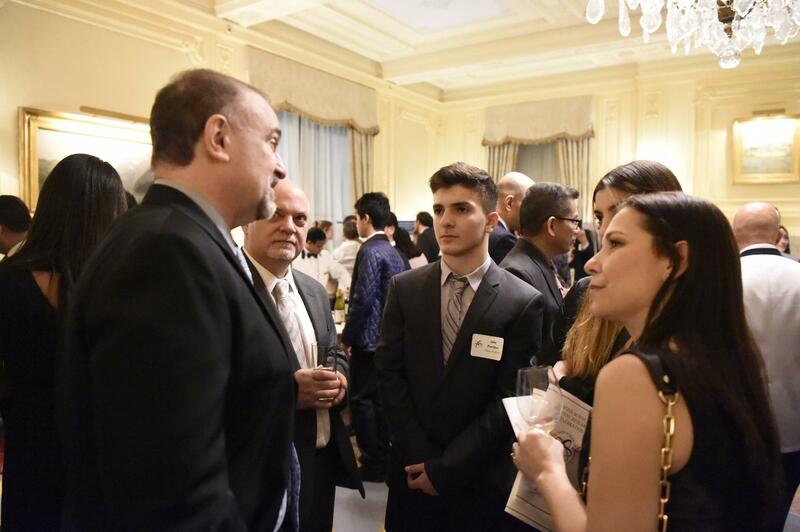 Later in the evening, Dr. George Yancopoulos ’76, Co-Founder, President, and Chief Scientific Officer at Regeneron Pharmaceuticals, was interviewed by Ms. Dava Sobel ’64, award-winning science author. To watch the interview in its entirety, click on the video above. The evening began as students entered a beautiful suite of rooms at The University Club, setting up their individual posters on tables around the room. As families and mentors entered the room, many were seeing their student’s final product for the first time. Teachers and students across different areas of study explored their peers’ work. “The projects this year, as in past years, demonstrate tremendous ability to integrate details into a larger body of knowledge,” Mr. Lee, a Biology research teacher, said. Walking around the room, one could find projects ranging from discovering new species of mushrooms to researching a potential microchip that could be used to detect Hepatitis C.
“The projects this year, as in past years, demonstrate tremendous ability to integrate details into a larger body of knowledge,” Mr. Lee, a Biology research teacher, said. 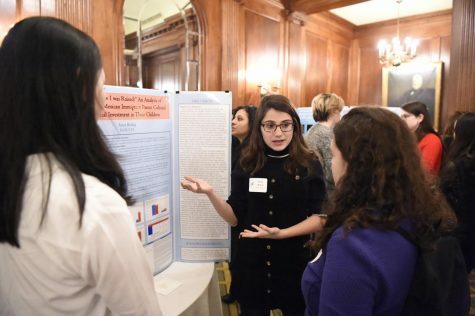 Maggie Wong ’19, one of the Science Research honorees, said that she learned extremely valuable skills during the past three years, such as how to work collaboratively in a professional setting with principal investigators, post-docs, and graduate students. “All of this will definitely impact my future as I move to college and beyond, helping to prepare me for the professional world,” Wong said. Artea Brahaj ’19 presents her research to alumni in attendance at the Science Research Celebration. Dr. Yancopoulos’ interview began promptly at 7 p.m. Ms. Sobel asked her first question, “Was it always biology? Or did something else pull you in at first?” Dr. Yancopoulos attributed his interest in biology and neuroscience to the intellectual spirit at Bronx Science, which pushed him to discover what he was the most interested in pursuing. 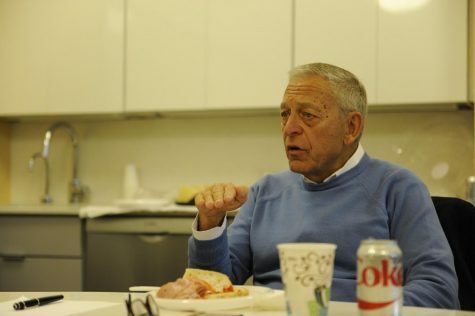 His experiences in Bronx Science influenced the naming of his company ‘Regeneron,’ which stemmed from his interest in studying regeneration, the process of renewal or regrowth in animal or plant tissue. 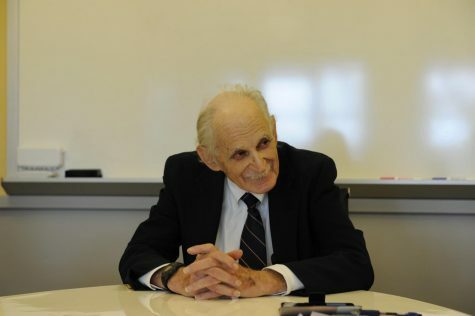 “I’m still interested in and working on [neuro]regeneration, which is what I started working on at the Bronx High School of Science,” Dr. Yancopoulos said. 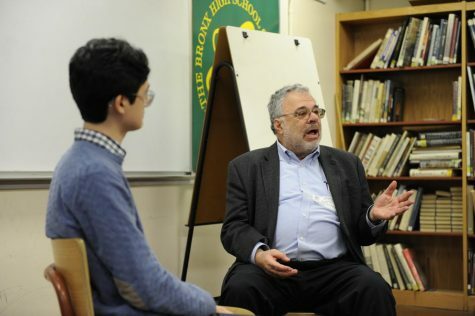 Dr. Yancopoulos also had a few pieces of advice for Bronx Science’s future scientists. He pointed to today’s overwhelming polarization and distrust in science and how we must not trust everything we hear or see. “You shouldn’t believe in climate change. You shouldn’t believe in evolution. You shouldn’t believe in anything. 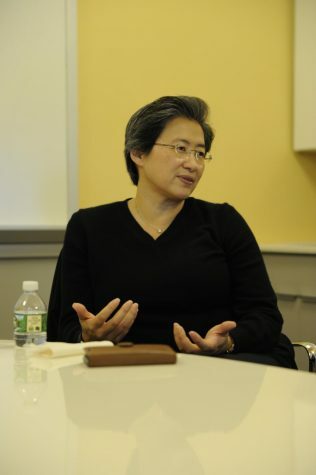 You should only believe in the things that you can actually experiment and test on,” he said. “Test anything that’s important to you. Try to disprove or prove them and learn about it.” Dr. Yancopoulos’ advice recalls ideas by René Descartes—French Renaissance philosopher, scientist, and pioneer of the modern scientific revolution—and his deductive approach to test hypotheses. 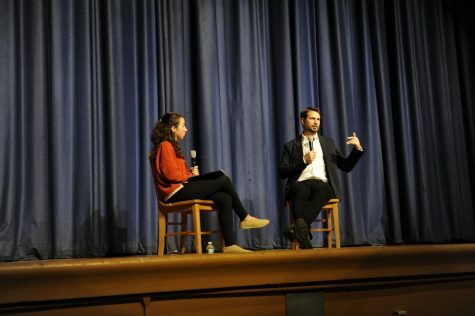 Looking around at the many students in the audience, Dr. Yancopoulos said, “It’s up to the next generation to not get dragged down by these fights, polarization, and views of extremists. 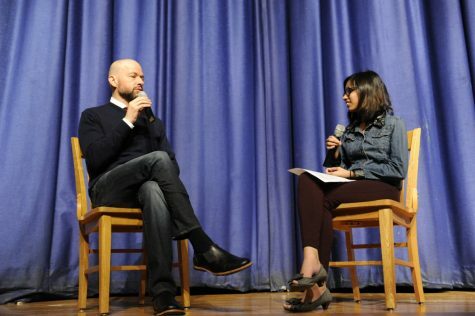 You have the opportunity to really take where mankind is and figure out how to move it up.” He believes that students should stay on track, think about what the big problems are, and trust what they can corroborate with their own experiences. 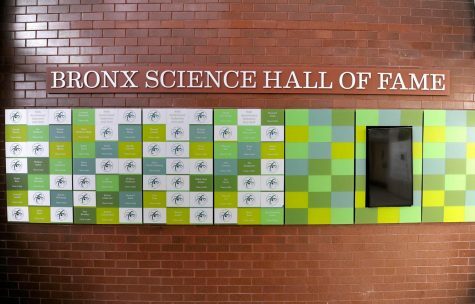 His energetic, optimistic speech not only kindled the spirits of the students in the audience, but also echoed the intellectual passion evident throughout Bronx Science’s history. 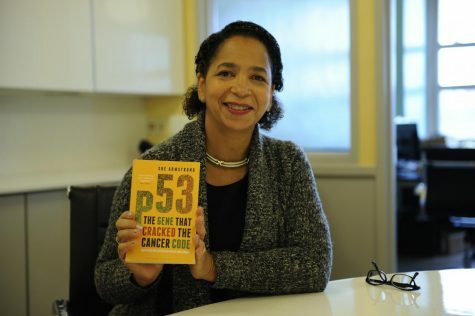 Dava Sobel ’64, award-winning science writer, reads a student’s Science research project. 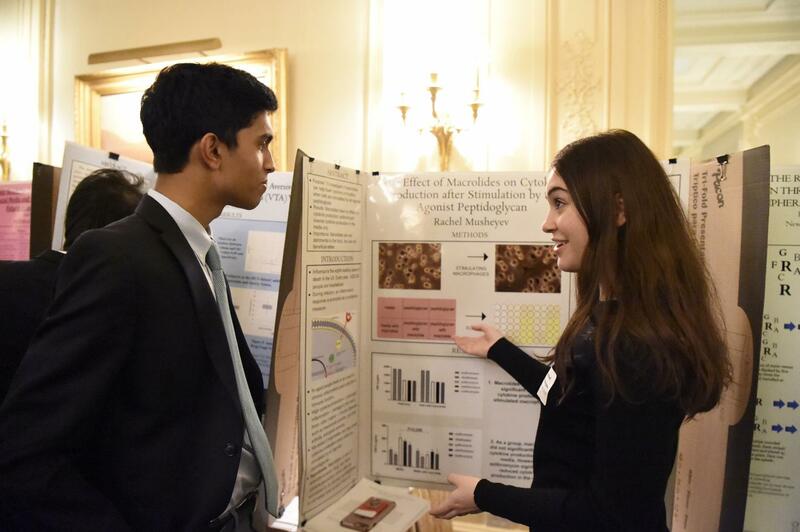 Rachel Musheyev ’19 explains her research project to a fellow research student. Dr. Yancopoulos ’76 discusses the benefits of the Science Research program as students and alumni listen intently.